The mission of the organization continues to revolve around the principle of service to community. A casual glance at the emergency response and fire loss statistics of the department provides strong support for the high level of confidence that local residents place in their fire department. The City of Ashland receives prompt and efficient emergency fire and medical services from two fire station sites, strategically located within the city. In addition to the provision of emergency services to the citizens of Ashland, the department maintains a strong reciprocal response agreement with surrounding agencies. The Ashland Emergency Radio Station is located at 1700 AM--tune in during emergency situations for up to date information. 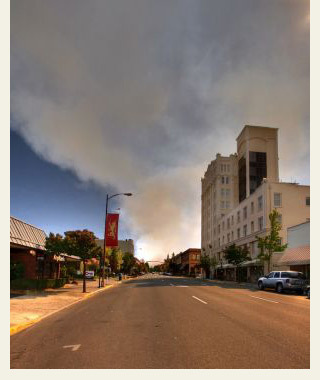 The Wildfire and Smoke Hotline number is 541-552-2490. Check this recording for information on local wildfires and controlled burning.